Summary: An easy out and back hike with views into the Maze. Directions: From Highway 95 in Utah the entrance to the Maze is located just north of the Hite Marina between the Colorado and Dirty Devil Rivers. Between mile posts 46-47 turn east on a dirt road. After a short distance you will come to a information board. Drive down this well graded dirt road for 30 miles (stay right at the split along the way). Note: at the 27 mile point you will pass a sign for the "Orange Cliff Ranger District". After 30 miles you will come to a signed 4-way intersection, turn right following the arrow to Standing Rocks/Doll House 20 miles. A short distance past this area the road begins to roughen until you reach a "4-wheel drive only" sign near Teapot Rock at which point it becomes down right terrible - take it slow. After what seems like an eternity you will pass a small parking area outlined by rocks on the left hand side. This is the parking area for The Golden Stairs Trail. Continue on until you see a small sign on the left for The Wall Campsite. A short distance later is a small rock outlined parking area (otherwise no sign marking the trailhead) on the left for the Chocolate Drops Trail. It took the author ~5 hours to reach this point from Highway 95. Road Conditions: 4-Wheel Drive only! Hike Description: From the parking area follow the cairns across the slick rock. The trail follows Chocolate Drop Ridge which is relatively flat the entire length. Along the way you will pass some large dark red sandstone formations and have nice views of the Maze. 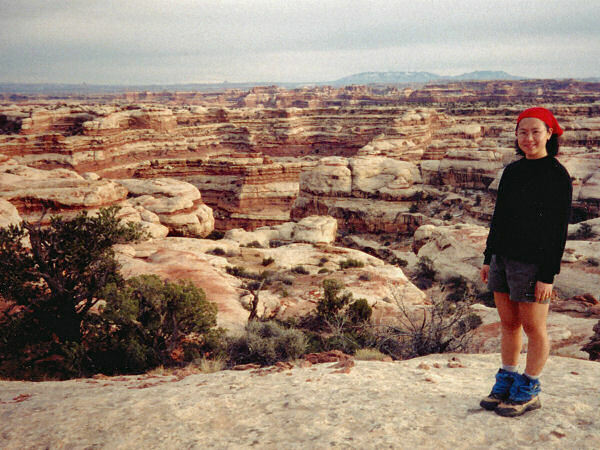 The trail terminates at 4 large, dark red sandstone walls with pale sandstone caps. These are the Chocolate Drops (not sure why they are so named). 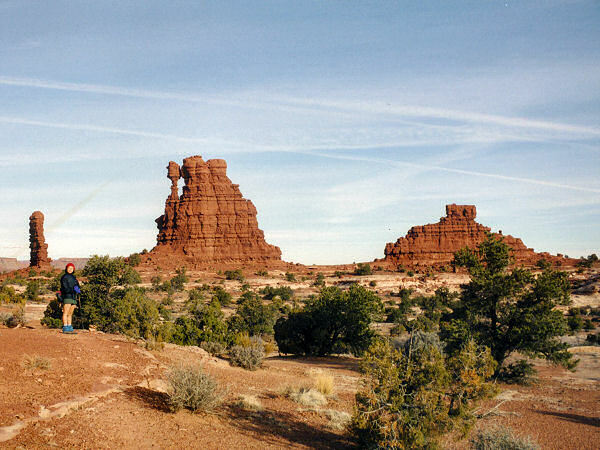 The trail fades shortly past these formations. Return the way you came. A nice easy hike with good views. The author and his wife completed this hike in just under 3.5 hours.